Pencil on paper , 34" x 32"
My name is Tatiana Dzhus. My surname in Russian sounds like “Juice”, so I chose my own pseudonym “Tatyana Juice”. I live and work in Russia, in St. Petersburg. I graduated from the St. Petersburg State Academic Institute of Painting, Sculpture and architecture Repin (drawing classes). 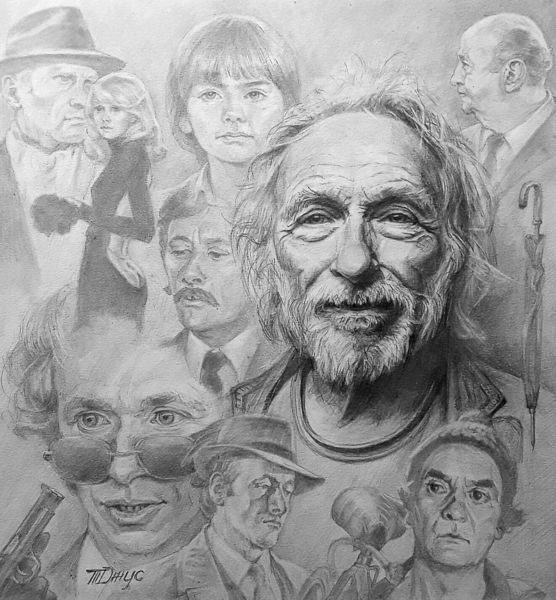 My drawing,“Pierre Richard,” is based on favorite actors and films through the eyes of the artist. I wanted the drawing to convey to the audience the wonderful play of the great actor Pierre Richard and to share the wonderful emotions that are present in all the films with Pierre Richard. I am a member of the Creative Union of Artists of Russia and of the International Union of Artists. I work in various techniques and genres. The nature of nature in a realistic manner of performance and portrait genre are the closest to me. I am a repeated finalist and winner of the international contest “Portretisto.The great masters of the portrait”. I am the winner of the international competition “THE BEST ARTISTS OF 2017 – AMERICAN ART AWARDS. ” As an artist I am inspired by nature, cinema, theater, literature and of course the person himself. It is important for me to convey to my viewers the vision of this world, to try to convey the nature of man, his deep essence, emotions. My works are in private collections at home and abroad.